This post is Part 2 of 3 in my three part series on Stocking Your Pantry, Fridge, and Freezer. Grocery shopping for one can be a challenge, especially when everything comes in massive packages. There are a few things that you can always have on hand that it's pretty likely you'll use before they go bad - encouraging you to eat at home but also saving you from wasting food and money! Make sure to read Part 1: The Post-Grad's Guide to Stocking A Pantry and subscribe to get The Post-Grad's Guide to Stocking A Freezer delivered straight to your inbox. Eating fresh, real foods out of your fridge will make you feel better and live healthier. Combined with my pantry staples, it's only a few easy steps in the kitchen to delicious, home-cooked food all the time. Eggs - Eggs last way longer than you think they do - up to 5 weeks after you buy them. It shouldn't be too hard to use a dozen eggs in that time. Use them for breakfast (so many options, including french toast, mmm), hard boiled for snacking or making egg salad, to top on dinners like stir fry or curries, breading meats like chicken, and baking. Worried they've gone bad? Learn how to test if an egg is still good to eat. Milk - The best thing about milk is that it comes in all sizes, so you can buy the right size container for your needs. While it's more economical to use a gallon, if you know you're just using a splash every day, like a quart. Before I started using more milk in oatmeal everyday, I even bought the "single-serving" milks in the pint size to not worry about wasting it. Use for coffee & tea, smoothies, cereal, baking, cooking, and dipping Double Stuffed Oreos. Milk lasts about 5 days after the "sell-by" date, which is usually longer than you'd think after you purchase - grab the one with the latest Sell-By date at the store if you're trying to prolong the life. Yogurt - I buy plain Greek yogurt by the quart and fly through it, but you can also buy the individual packs that last a long time and are convenient on the go. Any kind of yogurt is good for your gut and has protein, I would recommend checking out the sugar content though - yogurt can be pretty high in sugar if it's flavored. Use yogurt for snacking, in parfaits, in smoothies, and in savory dishes. Orange Juice - Vitamin C!!! So many different options, and getting one with calcium added is a good call. For breakfast, marinades, dressings, and smoothies. Butter - I always have sticks of butter (I am a strong believer in butter) as well as the soft Country Crock tub spread. Both are worth having on hand for spreading on individual dishes/items but also for cooking and baking. Last forever. Jam - Nothing like a pb&j with raspberry jam. Great to have for breakfast breads like muffins or english muffins, sandwiches, and one of my go-to late night snacks, pb&j toast. Confession: if you like grape jelly, I don't think we can be friends. Cabot cheese - I've always got Cabot in the fridge for snacking and grilled cheeses - snacking with apples (actually awesome, if you didn't know), cheese and crackers, and with veggies. If you wanted, you could buy another brand of cheddar cheese, but I strongly recommend against that - Cabot is the best there is, and that's not just because I went to school near the headquarters. It legitimately tastes more wholesome and creamy. Herb tubes - ...what? Yep, that's right, I said herb tubes. The dilemma is this: it's hard to keep fresh herbs on hand, but dishes taste way, way better with non-dried herbs in them. I've met in the middle with herb tubes. 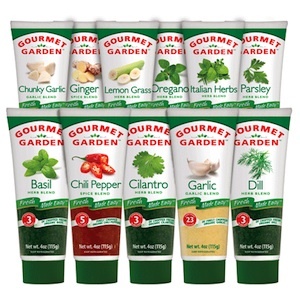 The most popular brand, Gourmet Garden, makes their chopped herbs with no artificial flavors or preservatives - which is pretty cool. The herb flavor is so much more vibrant than dried herbs, and last multiple months in the fridge compared to fresh herbs, which I can barely get to last days before wilting and turning brown. I use lemongrass and parsley weekly in my kitchen, but there are 10 different varieties you can experiment with. Apples - Healthy snacking = healthy life. I always have a few apples on hand for eating sliced with peanut butter or with honey & cinnamon. It's my go-to snack to throw in my purse if I know I'm going to need a pick-me-up. I also love them cooked into my oatmeal in the mornings - it's almost like I'm eating apple pie. Almost. My favorite are MacIntosh. Lemon - Adding a bit of acid to a dish really makes a difference - I keep lemons on hand for seasoning meats like chicken, shrimp, and salmon, as a crucial ingredient in shrimp scampi, salad dressings and marinades, tea, and baking (lemon zest in pancakes, especially blueberry pancakes, is YUM). Let's be honest - I also have them for cocktails. Lemons aren't too expensive and last a while, so it's likely you'll use the one in your fridge before it goes bad if you always have one on hand - you'll be glad you did. Lime - While I can pretend that I use lemons for cooking, I will straight up admit that I buy limes for drinking and mostly drinking. Lime juice completes margaritas and gin and tonics, my two favorite at-home cocktails. I do use limes for other things, sometimes - to squeeze on top of my fish tacos, to season seafood like shrimp or fish, and dressings and marinades. Like lemons, limes are a small investment with a long shelf life that have big payoff. Highly recommend keeping at least one in your fruit drawer in the fridge at all times. Good parmesan cheese - You never know when you're going to need cheese for something - pasta, soup, mac & cheese (because obviously you should add more cheese on top of your already cheesy mac & cheese) eggs, and, most importantly, quality cheese really raises the bar on my post-grad pasta and meatballs. I buy a block of good parmigiana reggiano from the cheese display near the deli section of the grocery store, and because it's a hard, dry cheese, it will last a long time in your fridge. P.S. to keep mine fresh even longer, I vacuum seal it using my FoodSaver - trust me, you need one. Carrots and/or celery - like apples, these veggies are great for snacking and last a while in the vegetable crisper drawer in your fridge. They're easy to bring on the go plain or with a dip (like ranch dip, or throwback to your childhood with my personal favorite, ants on a log). Note: there are a few items that are stored in the pantry but once opened, should be kept in the fridge (like mayo, dijon mustard, soy sauce, and ketchup). Check out the stocking your pantry post for further inspiration. What's one thing that's always in your fridge? Comment below!